Pain associated with headaches can be concentrated in any area of the head; however, women may wonder why theirs always occurs in the back of the head and if it's a cause for concern. Continue reading to learn all about headaches in the back of the head, including management and treatment options, so that you can go back to having clear thoughts. Why Do I Have Headaches in the Back of the Head? A tension headache is the most common type of headache that can cause feelings of tightness and pressure on the sides and back of the head. Tension headaches that occur specifically in the back of the head can be due to constricted muscles in the back of the neck and scalp from bad posture, alcohol abuse, stress, fatigue, and more, with stress often being the most commonly reported trigger. 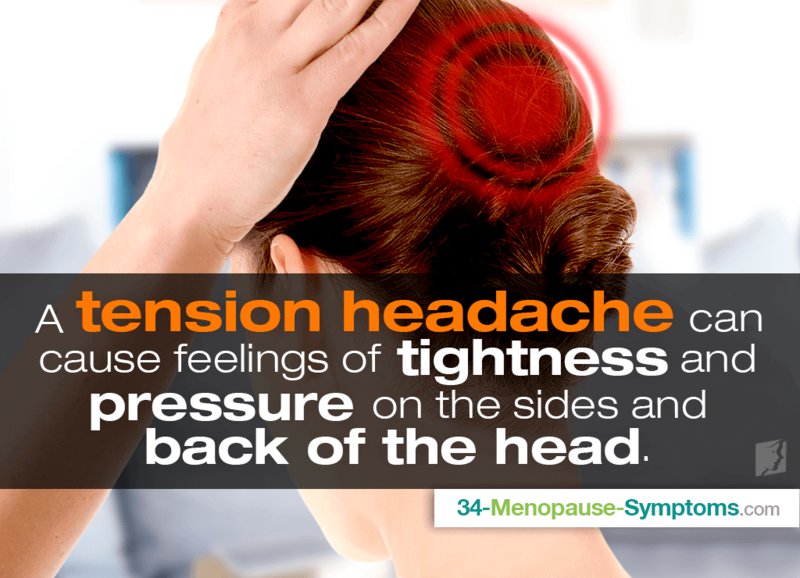 Also, since tension headaches occur more frequently in women than in men, the fluctuation of hormones - estrogen and progesterone - is believed to influence headache patterns, especially headaches during menopause. Other less common causes of headaches in the back of the head include arthritis, herniated disks in the cervical spine, and occipital neuralgia that damages the nerves from the spinal cord to the scalp. Finding relief from any type of headache first involves pinpointing the underlying cause and then tackling that issue for optimal results. In the case of headaches in the back of the head that suddenly occur with the transition into menopause, hormonal imbalance is often to blame. Because stress is a major trigger of headaches and aggravator of various other menopause symptoms, practice relaxation therapy to reduce muscle tightness in the neck and scalp. These can include deep breathing exercises, yoga, meditation, progressive muscle relaxation, biofeedback training, and more. For improved results, use alternative medicine in conjunction with lifestyle changes. These herbal medicines, including phytoestrogenic supplements and hormone-regulating supplements, help remedy the hormonal imbalance that provoke stress, anxiety, fatigue, and other causes of headaches. As women transition out of their fertile years, drastic hormonal fluctuations and accumulated stress may be to blame for recurrent headaches in the back of their heads as they cause tightened muscles in the back of the neck and scalp. While quick relief is simple, starting with stress-reducing techniques to relax muscle tightness, long-term reprieve involves treating the underlying hormonal imbalance at fault. To do so, implement the use of alternative medicines renowned for menopause headache treatment. There are several things that can trigger migraines during menopause. Keep reading to know more. Types of headaches are tension headaches and migraines. Headaches are caused by hormone fluctuations, but certain foods can also trigger them.